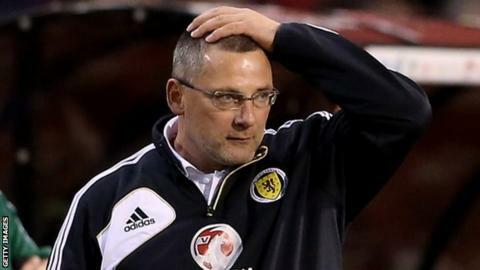 Scotland fans have lost faith in manager Craig Levein, according to a supporters' spokesman. The Scottish FA has been holding talks over Levein's position with a decision expected on Monday. Association of Tartan Army Clubs representative Hamish Husband told BBC Scotland he fears for Levein. "As long as he remains the manager then every Scotland fan should support him," he said. "However, I wonder if his days are up." Scotland are bottom of World Cup qualifying Group A with two points from four matches. The BBC understands that the SFA board wants more information before making a final decision. "I'm not surprised by it (the delay over an announcement) that's the way international football federations work," Husband told BBC Scotland. "I think the issue is that Craig Levein is, in effect, a civil servant because he has gained this big brief. "He seems to be involved with coaching and in the body of the SFA, so, it's going to take a while. "His progress is such that we're bottom of a not particularly difficult group. And the last campaign wasn't particularly good. "It's not for me to say that any Scotland manager should be sacked because any man sitting on the bench, is in effect, me and if he's the manager against Luxembourg then I'm wholly behind him." Husband said the Scotland fans are desperate for the national side to qualify for a major finals and that is what the manager should be charged to deliver. "All I wanted from him was that on the last day was to play Croatia at Hampden and for the nation to be ignited the way it was five years ago when we played Italy." Husband said the Scotland fans are "patently not" behind Levein, adding that "bottom of the group just isn't good enough". "We're left in no-man's land: what I want is a Scotland manager who is bold and incisive and able to take decisions; (who is) also imaginative; just now Craig doesn't fit the bill. "I want somebody that does." Should Scotland stick with Craig Levein? Read more on Craig Levein - Should he remain as Scotland manager?